Rather than trying to stretch themselves to pen (or cover) a full album of holiday tunes, big name acts like Coldplay and the Killers have gone the smartand commitment-freeroute, deciding to release individual, holly jolly ditties that get the job done without outstaying their welcome. In what is fast becoming a holiday tradition for the Vegas natives, “Don’t Shoot Me Santa” picks up right where last year’s download-only hit, “A Great Big Sled,” left off. 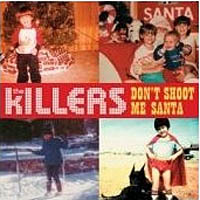 Keyboard pounding, mariachi breakdowns, and Shangri-Las-style vocals drive the song’s narrative, which shifts from balladry to spoken word hilarity as frontman Brandon Flowers pleads for forgiveness from a vengeful Saint Nick. Add to all that a hilarious low-budg music video and the fact that 100 percent of the download proceeds benefit African AIDS programs and you’ve got yourself a Christmas tune done right.